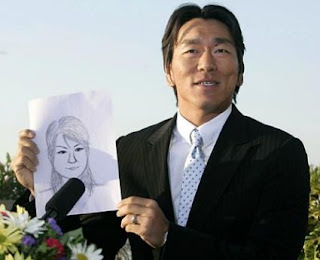 Vandelay Industries: Who Is Hideki Matsui's Wife? New York Yankees player Hideki Matsui announced that he snuck off to New York yesterday to get married. Just who is this mystery woman, and is she a HOT baseball Wife? Of course, the new wife of Hideki Matsui remains a mystery. We will, of course, update this page once we find out who she is. We do know that she is 25 years old, Japanese and is evidently anime. Matsui met the 25 year old cartoon after watching an old A-ha "Take on Me" video which she helped choreograph. Evidently cartoons don't age. Eat your heart out Jessica Rabbit!